The building in the late 1930s. Ref: Hocken Collections AG-512/288. Ross & Glendining Ltd was at one time the largest manufacturing company in New Zealand, and part of a thriving domestic industry in textiles and clothing. John Ross was born at Caithness in the north of Scotland, and Robert Glendining came from Dumfries in the south. Ross managed a drapery in his native country before coming to Dunedin in 1861, bringing with him thousands of pounds worth of stock. He became a partner in Begg, Christie & Co. and within a year bought out the firm. He went into business with the recently arrived Glendining in August 1862, just as the discovery of the Dunstan goldfield brought a fresh ‘rush’ to Otago. The company moved from retail to wholesale trade, and in 1866 built a brick and stone warehouse, some of which survives within the present 8 Stafford Street. The builders were McKay & Goodfellow and the architect was John McGregor (I’ll return to the intriguing Mr McGregor and his other designs of the 1860s and 70s in a later post). Elaborately decorated in the Venetian Gothic style, the Oamaru stone facade of the warehouse featured pairs of arched windows, and columns of Port Chalmers bluestone topped by carved capitals. Ornamental ironwork included an unusual parapet railing, and finials on the first-floor sills. 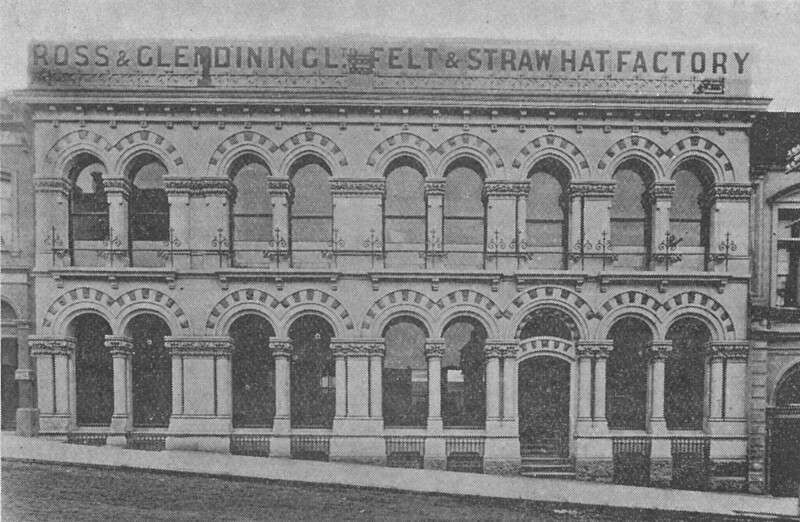 An illustration of the building from ‘Beautiful Dunedin’ (1906), taken not long after it was converted to a hat factory. The original portion is on the right (the entrance shown being at its centre). Looking down Stafford Street towards Princes Street around the 1880s. Ref: Hocken Collections S09-529j. 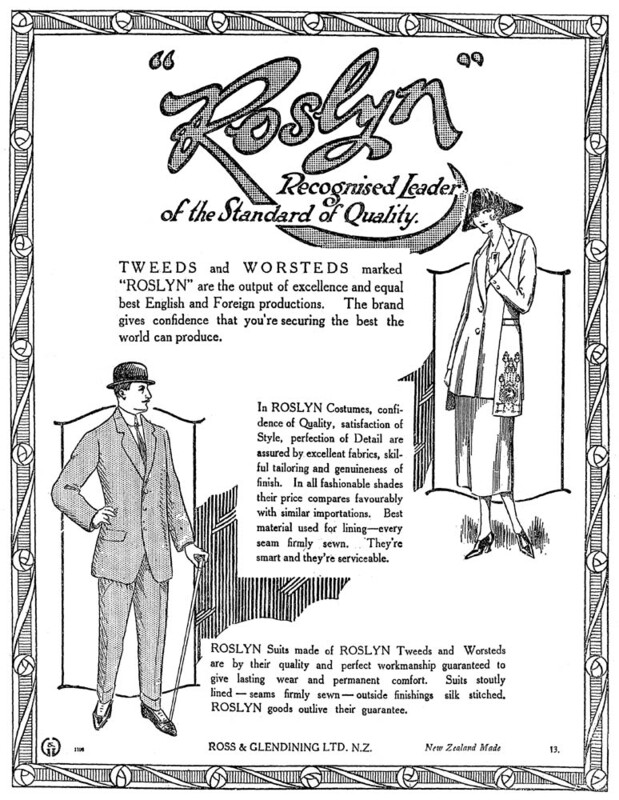 Ross & Glendining established the Roslyn Woollen Mill in Kaikorai Valley in 1879, and soon after went into manufacturing, opening branches throughout the colony. Extensive additions to the Stafford Street buildings were built in 1874, with Mason & Wales the architects and H.C. McCormack the contractor. 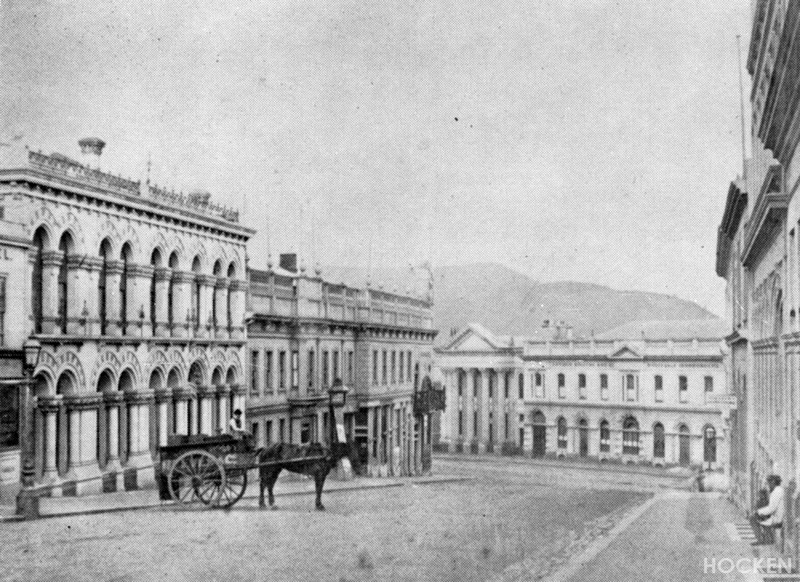 The facade was extended further up the street and McGregor’s original details were carefully replicated, an Otago Daily Times report remarking that ‘instead of the patchwork appearance which generally characterises additions to buildings, the building, as complete, is carried out on one plan, and looks accordingly’. The basement level was used for packing and record entry. The ground floor was fitted with counters and shelving for trading manchester, and offices were put in the front of the addition. The upper floor was used for warehouse purposes, and housed fancy goods, hosiery, and haberdashery departments. A hydraulic lift made by Frazer, Wishart, & Buchanan was capable of lifting weights of up to one and a-half tonnes. ‘Clarke’s patent self-acting steel shutters’ were the latest in fire protection measures, and a brick wall two feet thick separated the warehouse from neighbouring wooden buildings. 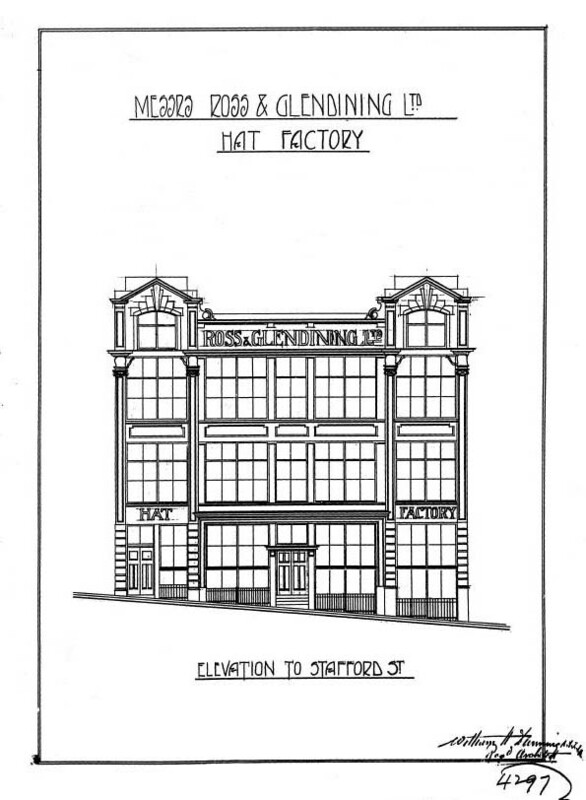 The building at 8 Stafford Street is best understood in relation to some of Ross & Glendining’s adjoining and nearby buildings. In 1875 a new bonded warehouse was built facing High Street, back-to-back with the original premises. The two buildings were connected by a tramway across a large yard, where there were stables and other outbuildings. In 1893 the company moved its offices and warehouse to an entirely new site further down High Street, opposite the end of Manse Street (where Broadway now begins). The clothing factory moved into adjoining premises. The old Stafford-High complex remained in company ownership but was leased to tenants until about 1900, when major redevelopment began and the entire site was turned to factory use. This work was designed and overseen by Charles Lomax, the company’s Inspector of Works. The High Street clothing factory was completed in 1901, its almost entirely rebuilt structure including a further two storeys, with an 18 metre high chimney behind (to save confusion I’m saving full description of this building for another post). Work on the Stafford Street portion began in 1902, and in January 1904 it reopened as a hat factory, where fur, wool, felt, and straw hats were produced. Two years later, the top floor was converted to a mantle and costume factory, but the major rebuilding came in 1919 when a new four-storey block was built at the rear, and two additional storeys were added to the front portion. This was when the Stafford Street building took on its current outward appearance. 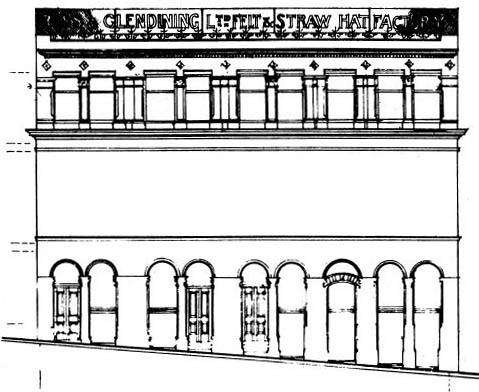 A 1918 drawing shows the addition of just one floor and retention of the old facade below, however, a plan deposited in March 1919 shows a total of five floors (including basement) and an entirely remodelled facade in a transitional style reminiscent of the work of Charles Rennie Mackintosh. The designer was William H. Dunning, a Tasmanian-born architect whose other work in Dunedin included the National Bank in Princes Street, Ross Home in North East Valley, the RSA Buildings in Moray Place, and Barton’s Buildings. Fletcher Bros were the builders. Plan lodged August 1918, showing the original proposal for one additional floor. Dunedin City Council Archives. Plan lodged March 1919, showing the final design with two additional floors and an entirely new facade. Dunedin City Council Archives. There are 100 Singer machines in this room, electrically driven. The only foot action for the worker is the use of the treadle for regulating speed. The harder she presses the faster the machine runs. The presser-foot on each machine is operated by the knee, leaving both hands free for guiding. The installation of the electric iron saves gas fumes, and two electric cutters are able to save a lot of heavy work. The pressers’ room on the same floor is supplied with a steam press of the very latest type, saving a lot of time and labour. The making of dress buttons being forced on us as a result of the war, six machines are provided for that purpose. The woven material used in making the costumes and other goods is from the firm’s own Roslyn mills, so that the finished articles as sent to the shops are to all intents and purposes produced from our own resources except for linings and thread. This being the case, it is very gratifying that Mr C. W. L. King, the manager, is able to show a variety of goods that for material, style, and make can be put alongside the best productions of Australia or Europe. Consideration of this phase of the subject leads one to the belief that the diversity of design in such a factory is not only good for business but food for the workers, inasmuch as it must be much more interesting to be engaged on varied work that touches the domain of art, and has some individuality about it, than to stick for days and weeks at one mechanical operation of the prosaic and unromantic order. The fourth floor was an ‘up-to-date dining room on the restaurant model’, where morning tea was provided at 10 o’clock, and midday meals could be heated. Apparently it wouldn’t do for the male staff to eat with them, so the men had a separate dining room above. The flat roof was ‘available as a promenade for the girls’, and from it there were good views the harbour. In 1924 a fire significantly damaged the top floor (32 firemen fought the blaze). In 1930 a new boot factory building of utilitarian design was erected on the middle of the site, between the two main buildings. Miller & White were the architects and Thomas Ferguson was the building contractor. The same architects and contractor were responsible for the addition of a further two storeys to this structure over the summer of 1937-1938. Advertisement from the Northern Advocate, 22 June 1922 p.6 (Papers Past). 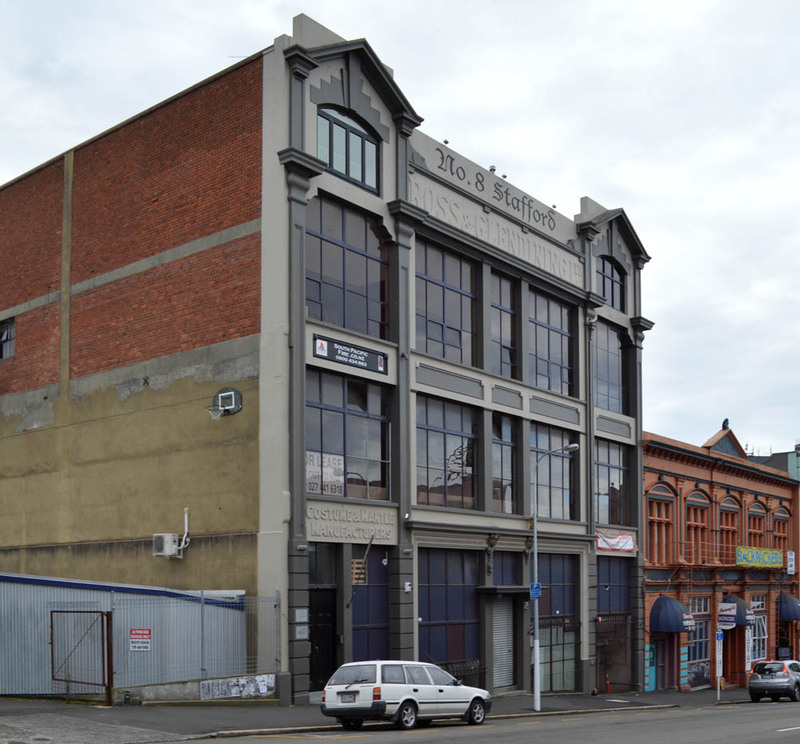 Ross & Glendining was acquired by UEB Industries Ltd in 1966, and subsequently merged into Mosgiel Woollens Ltd. Mosgiel vacated the Stafford Street building in 1973, and Sew Hoy & Sons occupied it until about 1980. 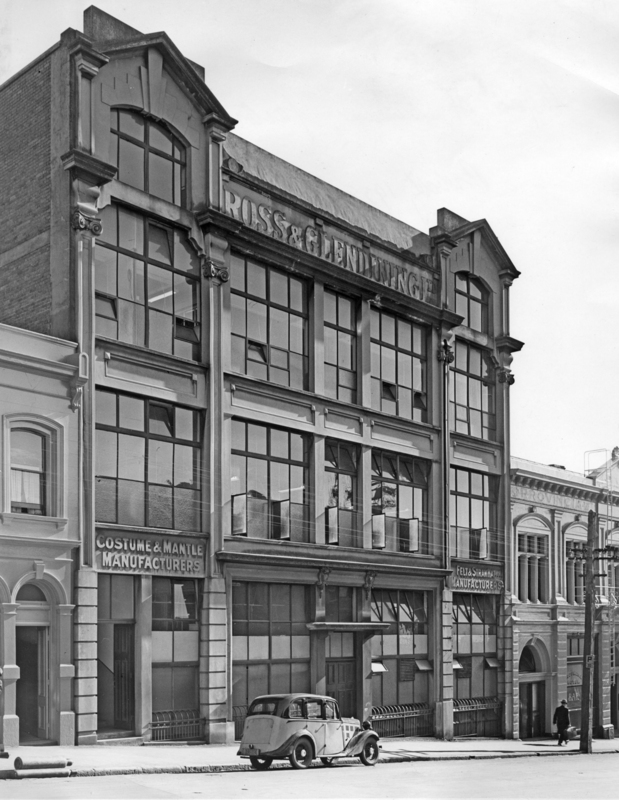 Mosgiel retained a knitwear division in the High Street building until it went into receivership in 1980. A variety of businesses operated from 8 Stafford Street over the next three decades, and between 2010 and 2011 it was partially converted to apartments. Current redevelopment plans by owners Jason and Kate Lindsey will create a start-up and tech business hub, ‘for creatives, consultants and entrepreneurs alike’. This seems a fitting turn for the site of one of the most successful commercial enterprises ever to have come out of Dunedin. Otago Daily Times, 3 May 1866 p.3 (tender notice), 18 June 1866 p.5 (new Stafford Street building description), 27 October 1866 p.1 (advertisement), 1 April 1874 p.2 (Stafford Street additions description); 20 April 1875 (new High Street building description) p.2; 15 April 1893 p.3 (new warehouse) , 1 April 1901 p.1 (plumbing tenders – High Street), 15 June 1903 p.3 (‘an important industry), 23 July 1918 p.7 (Stafford Street additions description); Evening Star, 8 July 1919 p.3 (description of additions); New Zealand Herald, 28 April 1924 p.6 (fire). Fahey, W.H. Beautiful Dunedin : its environs and the cold lakes of Otago. Dunedin: Evening Star Co., 1906. Jones, S.R.H. Doing Well and Doing Good : Ross & Glendining, Scottish Enterprise in New Zealand. Dunedin: Otago University Press, 2010. This entry was posted in Buildings and tagged 1860s, 1870s, 1910s, Clothing, Factories, Fletcher Bros, Gothic, H.C. McCormack, Hats, Interwar, John McGregor, Mason & Wales, McKay & Goodfellow, Ross & Glendining, Stafford Street, Venetian, Victorian, W.H. Dunning, Warehouses on 26 November 2015 by David Murray.